Architecture practice Studioshaw has completed Kindred, a new creative community space in Hammersmith, West London. 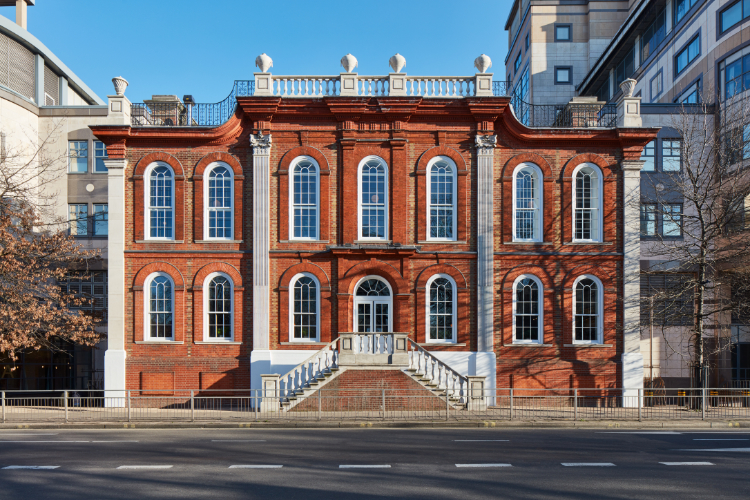 The 7,500 sq ft scheme, which opened to the public in January 2019, sees the transformation of the existing Grade II listed Bradmore House into a multi-use development. 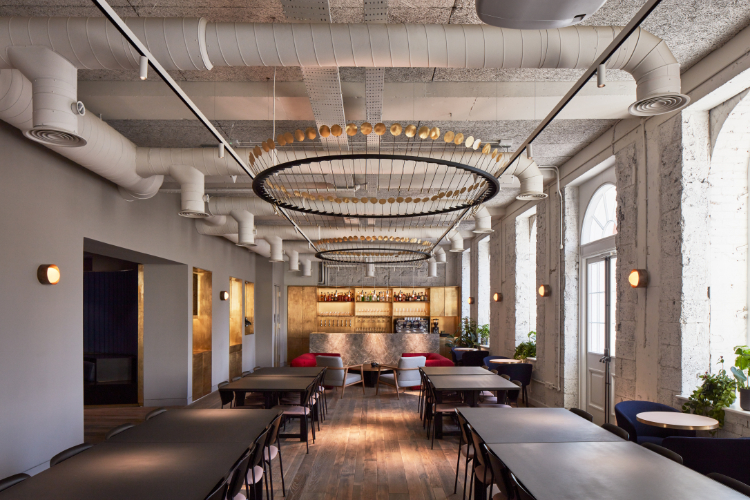 The scheme, which seeks to promote community spirit and collaborative working, comprises a café, bar, restaurant, live events venue, studio rooms for wellness activities and co-working space. Located next to Hammersmith station, Studioshaw’s scheme occupies an existing three-story building. The design reflects the different uses and characters of each of the floors. The ground floor is set to be open all day to the local community whilst the upper two floors are reserved for Kindred members and their guests. 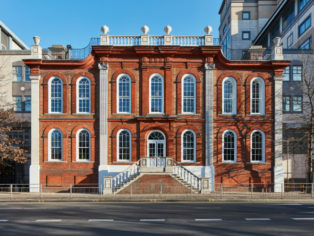 The sensitive design makes use of the building’s existing features, removing layers of interventions and revealing the listed walls of the building, expressing the large Georgian windows. The walls are painted in heritage colours to compliment the original features of the building. Connected to the surrounding public realm of Bradmore Square, a private planted terrace links to the ground floor all-day café/bar offering. 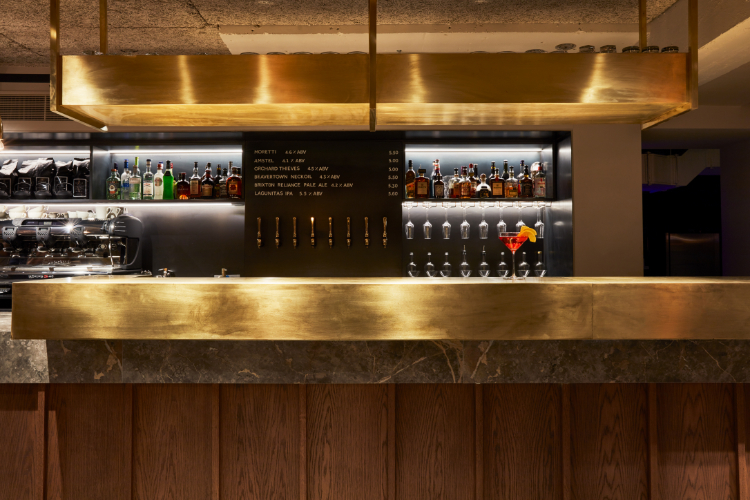 Furniture by Hay, combined with a palette of materials such as marble and brass detailing, has been used to create a contemporary yet classic bar feel. The central level is flexible to allow for a variety of functions; by day the space facilitates co-working, and by night it will offer food, music and events. Community spirit was central to the client’s brief, so Studioshaw has created a design that allows members to sit down and relax with one another at the end of the day, whilst also offering a space that will maximise creativity, productivity and collaborative working. 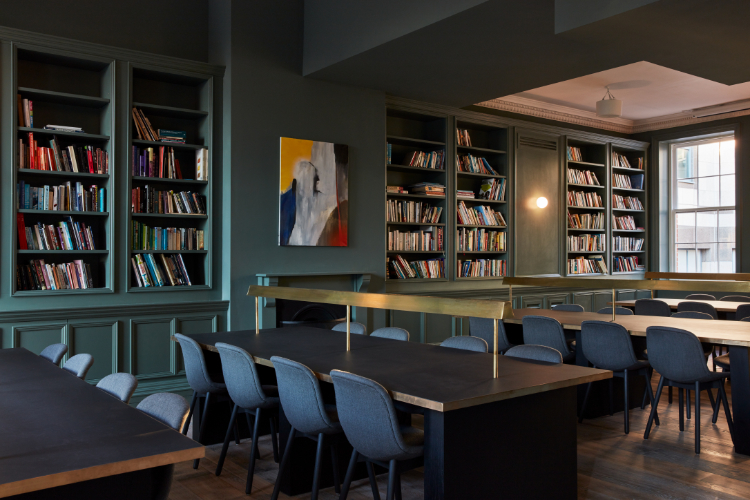 The top floor contains a series of private rooms suitable for yoga and meditation, meetings and private dining, which can be reconfigured and connected for larger events. On this floor is a listed ornate, panelled room that was previously housed at the Geffrye Museum and returned to the site in the 1990s. All architectural features and artefacts have been salvaged and incorporated into the interior of the building, such as the early 18th century panelling and cornices, and the timber on the walls of the staircases. 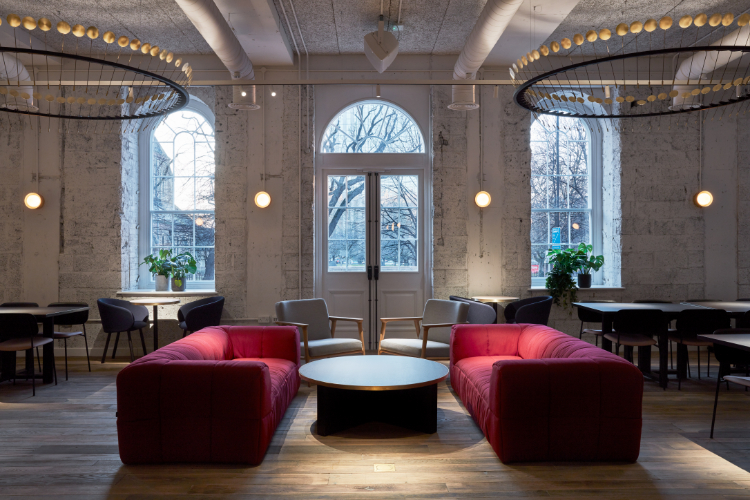 Key design features for the scheme include bespoke furniture pieces, suitable for the differing co-working/dining requirements and an atmosphere-responsive chandelier. A collaboration between manufacturer and design gallery Matter of Stuff and designer Umut Yamac, sculptural kinetic chandelier ‘Flicker’ is part of a new series of Yamac’s works, which take inspiration from fluttering autumnal leaves, the season in which the project was developed. Conceived as a focal point for the space and manufactured in Italy by Matter of Stuff, the chandelier features seventy long-stemmed brass leaves that balance from a ring-shaped canopy and are perpetually in motion, providing animation and intrigue. This animation creates new and unexpected dialogues between the space, user and light.